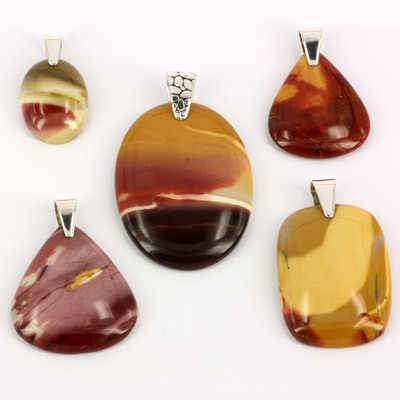 Mookaite and Sterling Silver Pendants. Wholesale. Buy Australian Gemstone Jewellery Directly from Supplier. 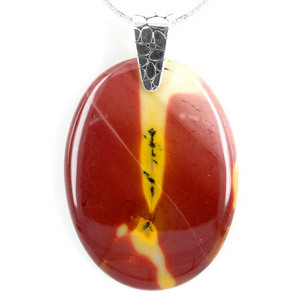 Mookaite is found in Western Australia on the former Mooka Station, which is located about 170 km east of Carnarvon and about 850 km north of Perth. Mookaite is composed mainly of massive ultrafine silica and contains fossils of radiolarians which are amoeboid protozoa with mineral skeletons. Mookaite comes in a wide range of beautiful colours from yellow and white to orange-red, purple and mauve, which are the result of iron staining. The Gemmological Association of Australia (GAA) has published a 5-page article on mookaite in their journal "The Australian Gemmologist" Volume 24, Number 3, July - September 2010.